Our Full Screen Mode functionality was added to WP Google Maps (Basic) in version 6.4.00 (October 2016). 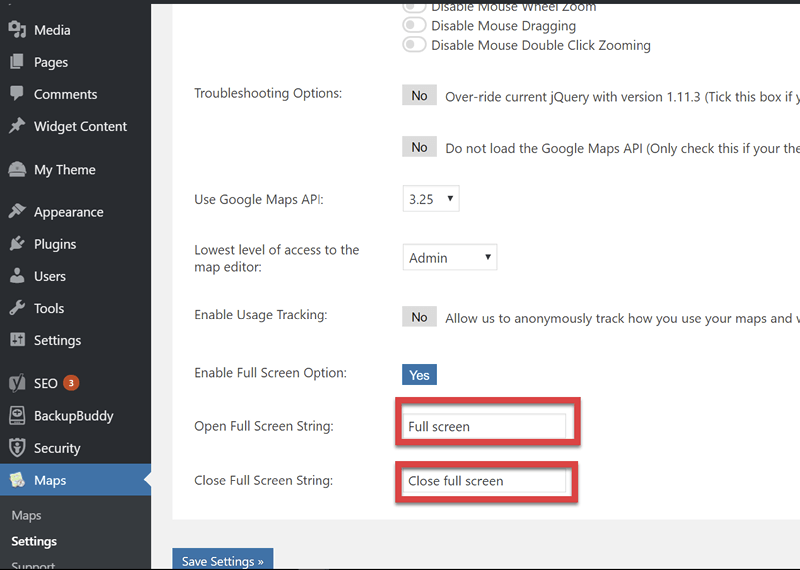 To enable Full Screen Mode, see your WordPress Dashboard → Maps → Settings → Maps Tab → Enable Full Screen Option. Click the No button next to Enable Full Screen Option. It will change to Yes. You can change the strings associated with the Full Screen Mode if you’d like. Change the strings in the box next to Open Full Screen String and Close Full Screen String as desired. (These changes will reflect in the front-end). When finished, click the Save Settings button. View your map on the front-end of your site. Click the Full Screen button (the button label may differ if you’ve changed the strings in the Settings above). Your map will open in Full Screen Mode. To return to the default map size settings, click the Close Full Screen button (the button label may differ if you’ve changed the strings in the Settings above). This covers using Full Screen Mode with WP Google Maps. If you need further assistance with Full Screen Mode or are having other issues with the plugins, feel free to post on our Support Forums or visit our Support Desk.